We’ve just completed the process of renewing our Gold partner status with Microsoft. Among other things, this ensures we have early access to upcoming software through the CTP and beta programs, as has been the case with office 2010 over the last year. The Gold level now has a requirement for completion of an independently run Customer Satisfaction survey, and thanks very much to everyone who completed this. The scoring and comments are much appreciated, and it was good to see the consistently high scores. We’re of course reviewing the areas where we didn’t score perfectly as we strive to further improve the service we offer. Our prime focus is on cube based reporting and analytics, but we do also support querying of relational databases in both Excel and on the Web, and have a number of customers using the product purely for relational reporting. We extend the native Microsoft functionality in excel, and add support for this in the Web product. 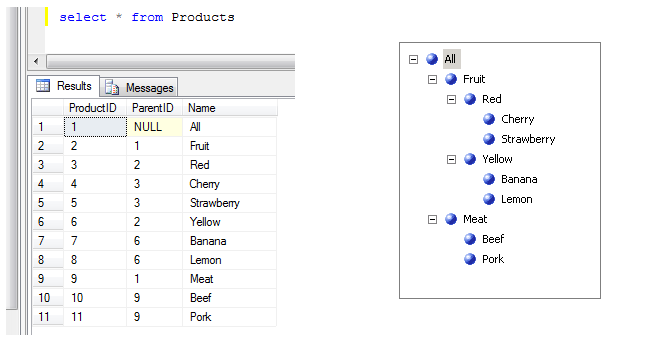 The connection string and query string can both be formula driven so you can construct parameter driven reports with ease. – Search for ‘relational database access’ in the help file for an overview. XLCubed supports both grid and formula based writeback against Analysis Services, in Excel and on the Web. As such it lends itself well to planning and budgeting applications, and it’s an arena in which we have a lot of experience, from the straightforward through to the highly complex. a) They’re really useful – thanks! b) Youtube access is blocked by our corporate internet policy! 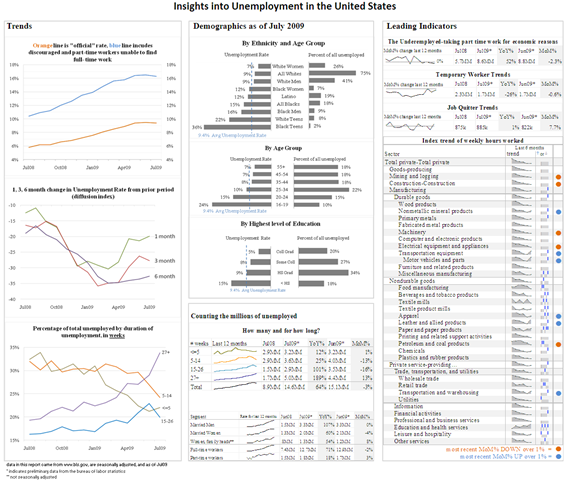 In the following example we work through a real world example of a data visualization. We’ve chosen an example that involves Operations data – this is fairly non-domain specific so hopefully it can demonstrate some important points. The first, and most important point is that you have to define your audience. We receive many questions about “what is the best chart for this situation” or “what colour should I use for emphasis”. These questions are usually attacking the problem from the wrong angle. The one question you need to ask before anything else is “who is this visualization going to be seen by and how?” Is it in a boardroom on a printed sheet or across a trading floor on a plasma screen. Are the consumers domain experts? This example features data about an investment bank’s operations processing, the audience being the clients of the Operations department. Unfortunately the reports either didn’t contain data at a granular enough level or it was difficult for the product managers to see where the issues were occurring and what the trends were. In reality the report showed what the major problems had been – unfortunately this was already known, as when something major goes wrong you remember getting shouted at! We felt this solution lacked clarity and it was very difficult to spot trends across products. 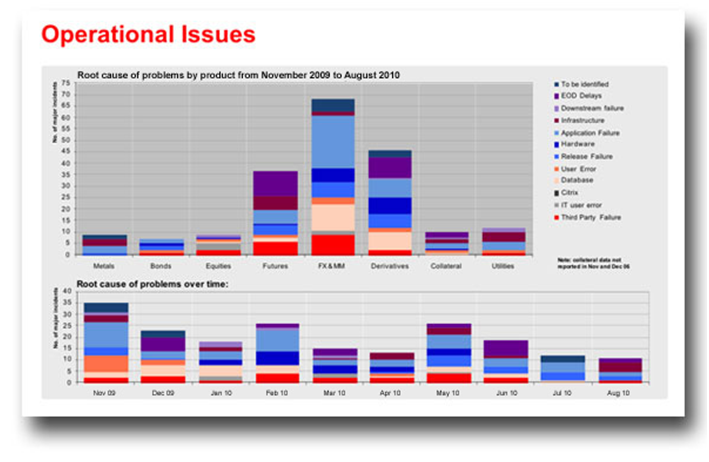 This solution allowed the user to view the data simply as a cumulative set of data by Product (top line) or by Root Cause (vertically) and then look deeper into historical trends in the centre of the chart. For example, its fairly easy to see spikes in the Root Cause data historically and see that the overall trend has improved over time. 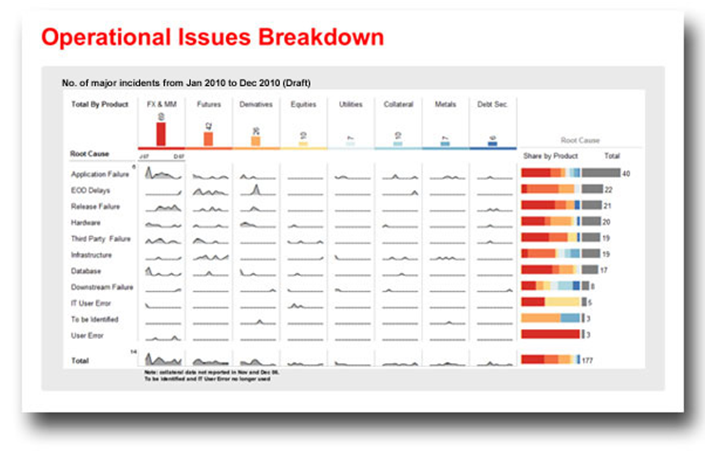 By ranking the Products and Root Causes you immediately give some sense of scale to the data. For example you can see that there are many more Application failures than any other type of problem, but the majority of root causes are otherwise fairly evenly distributed. One other point worth noting was that the original colour scheme was much more muted, but the client got very upset that it looked like a competitor’s corporate colour and wanted it to be “louder”. Ecstatic, 1 page replaced 34 and they could see at a glance how the entire (large) organisation was working but also quickly find out detail for a particular area and identify trends. Following on from our previous blog post on a couple of the common cube performance issues we’ve seen this last month, I thought I’d mention some of the non-technical issues we see quite often. In one case, once we’d made a few teaks and sorted out the cube performance issues we had to ask – Is the cube doing what it needs to? (Of course we did ask this first but the priority was sorting out the current cube performance!) Does it meet the business requirement? There’s no point in having the most complex cube that uses all the greatest features if it can’t answer the users queries. In reports, we’ve seen examples where clients have nested four or five attributes to build up the effects of a hierarchy or run huge queries then vlookups on them to get the data they need, or bring back 12 columns of data and manually work out year to date, or not have any hierarchies that reflected commonly used groupings of members, or not have member names formatted in the way the business needs. To us this just isn’t right. The users might not seem to care too much if they don’t know how the cube could work or if it runs fast enough to bring back huge result sets they can manipulate themselves – but doesn’t that negate the point of having a cube and your investment in it? Consumers of the cube should have fast, timely, accurate and importantly appropriate data made available to them in a manner that makes sense. Cube design and build is about understanding the business and users needs and then building the cube and associated processes, that’s before even starting to build the reports and conveying the information using good data visualisation practices. All too often we’re seeing a drive to use the latest tech, the flashiest widgets, cool looking 3D and shading effects on reports through to cubes and databases with every conceivable hierarchy or type of measure thought possible but not bearing much resemblance to what the users need to see. I won’t hide the fact that we’re very proud of our skills and experience in ensuring our clients get not just a technically excellent system but also one that fits their needs. If you want to talk to one of the team about how they can help, you can find our contact details here. A quick blog post from the Services team here at XLCubed on some performance problems with SSAS that we’ve seen again recently. With the processing power and memory available it’s pretty easy to build a fast cube – both for query performance and processing time. It is also easy to be lax in cube design, ignore the warnings and best practice guidelines, and end up with a cube that’s looks concise, is neat and clever but performs terribly for end users. Parent-Child dimensions – Parent-Child dimensions are nice and easy to build and use. However, as you can’t build aggregations that include a parent-child dimension it can make for a badly performing cube! Try to flatten dimensions out and evaluate exactly why a parent-child dimension is required and being used. They are not the only option..
Unary operators, Custom-roll ups – we’ve seen cases where these have been included in every dimension in a cube by default. If there isn’t a need for them – leave them out! If you can get around using a custom rollup or unary operator by some simple work in the ETL process it may be better to do that first. Cache vs. Non-Cache Data – Basically is the cube recalculating and re-querying numbers over and over again or can it re-use results? Use profiler to check for cache or non-cache data when your queries are running. So many times we’ve seen all queries not using the cache because AS hasn’t been given enough available memory or volatile operators such as now() have been used in mdx calcs. Resolving the issues above had a massive impact – reports taking up to 3 minutes to run were down to a few seconds, users could begin to use the application properly for the first time, however fixing the performance may be only part of the task. The cube of course needs to have been designed to meet the business requirements, but that’s another blog..
1) Ajay V Singh – Operations Dashboard for a Debt Collections Company. The dashboard layout is dense but uncluttered and well thought through. Colours are well balanced, and allow the reds to draw the reader’s attention as intended. Ajay’s background summary of the dashboard, with larger screen shots, will be available on our web site in the coming week. 2) John Munoz – Insights into Unemployment in the United States. 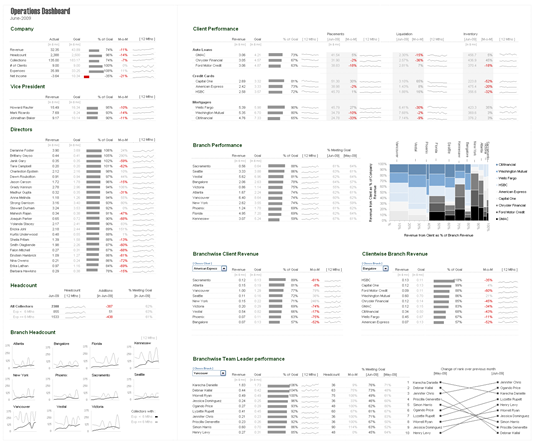 John’s background summary of the dashboard, with larger screen shots, will be available on our web site in the coming week. Lisa’s background summary of the dashboard, with larger screen shots, will be available on our web site in the coming week. We have decided to extend the entry deadline through the holiday period, to 28th August. See the competition page for more detail. -Thanks to all of you who have already entered, the quality has again been good, and will doubtless lead to an interesting debate when it comes to choosing the winners. As we’ve extended the deadline if there are any additional tweaks you’d like to incorporate you can of course send revised versions. There have been a few key announcements in the Microsoft BI world recently, we’ve gathered them up and summarised below in case our readership have missed any of the key announcements. “SQL Server 2008 R2 expands on the value delivered in SQL Server 2008 by providing a wealth of new features and capabilities that can benefit your entire organization. This release will further improve IT Efficiency with new and enhanced management capabilities and empower business users to access, integrate, analyze and share information using business intelligence tools they already know.” Read more here. Microsoft announced the release of SP1 for SQL Server 2008 earlier this month, for many this marks the psychological point at which they’ll take interest in and investigate the product in depth. With a large uptake of the product already in the market place and the fastest OLAP engine we’ve seen from Microsoft, there is now no excuse not to evaluate upgrading or migrating to SQL Server. Contact our services team for more information or how we can help you with SQL Server 2008. Service Pack 1 for SQL Server 2008 is now available for customers. The Service pack is available via download here and is primarily a roll-up of cumulative updates 1 to 3, quick fix engineering updates and minor fixes made in response to requests reported through the SQL Server community. While there are no new features in this service pack, customers running SQL Server 2008 should download and install SP1 to take advantage of the fixes which increase supportability and stability of SQL Server 2008. The MS BI conference last held in October 2008 in Seattle, WA has now been changed to an bi-annual event, citing global economic constraints to travel budgets worldwide, Microsoft are moving the BI conference to a bi-annual event, with the next conference scheduled in Seattle on October, 2010. The next BI Conference scheduled for October 2009 will be moved to October 2010 in Seattle, WA, and all further BI Conferences will be held every second year on an ongoing basis. Content till then will be covered at the SQL Pass Summit, TDWI and SharePoint conferences. Microsoft announced SQL Server® Fast Track Data Warehouse, a new set of Reference Architectures for SQL Server 2008 that enables customers to accelerate their Data Warehouse deployments and reduce cost. In addition, customers can further jump start their Data Warehouse design with new industry solution templates provided by System Integrators – Avanade, Hitachi Consulting, Cognizant and HP. Better performance out of box through pre-tested hardware. Customers can also choose the right Fast Track Data Warehouse with the right performance, storage capacity and pricing to suit their business needs. Unlike Appliance Vendors with proprietary solutions, the new reference configurations use industry standard hardware from Dell, HP and Bull giving flexibility and cost savings to customers. Fast Track Data Warehouse is available from today: customers will buy their SQL Server 2008 licenses through their preferred Microsoft Partner and the hardware from Dell, HP or Bull. If you’re looking to implement a data warehouse, contact the services team to see we can help. It’s been a few months now since the announcement by Microsoft of the demise of Performance Point Planning, and the rebranding of the Monitoring and Analytics elements as PerformancePoint Services. This was an announcement back in January (09) that caught many by surprise, however for us its provided a useful segue into the new XLCubed Planning application. Many customers were waiting to see what was coming next, when PerformancePoint would be ready to compete with the likes of existing players with proven planning technology (i.e. in memory OLAP) and the tempting announcements around Gemini certainly added confusion. Now looking back at the conversations we had in Seattle and Microsoft presentations perhaps the announcement isn’t as big a surprise as it felt at the time. As above our long term commitment to an Excel front ended planning application continues, the demise of PerformancePoint Planning has simply increased the market for us and in many ways freed clients from the constraints of using purely Microsoft technology. Augmenting the Microsoft toolkit and providing our clients with the functionality they need to build effective planning, budgeting and forecasting applications remains at the forefront of our product set and services. If you want to know more about our products and services (consulting team) just send an email to services@xlcubed.com and someone in your region and market sector will get back to you straight away. Here at XLCubed we’re often asked how the product sits in relation to the Microsoft Business Intelligence tools. The answer is that we add to and augment the features and functionality that Microsoft has to offer. Excel is a fantastically powerful and flexible spreadsheet engine and this is exactly what it should be used for. However all too often, Excel is used as a database. With linked spreadsheets, and huge data extracts. Like last year, the competition is for real world solutions, we are not providing a sample data set, and we’re looking forward to seeing some great examples of reports, charts and dashboards. Data management, data logic and calculation : YTD figures, variances, etc…. 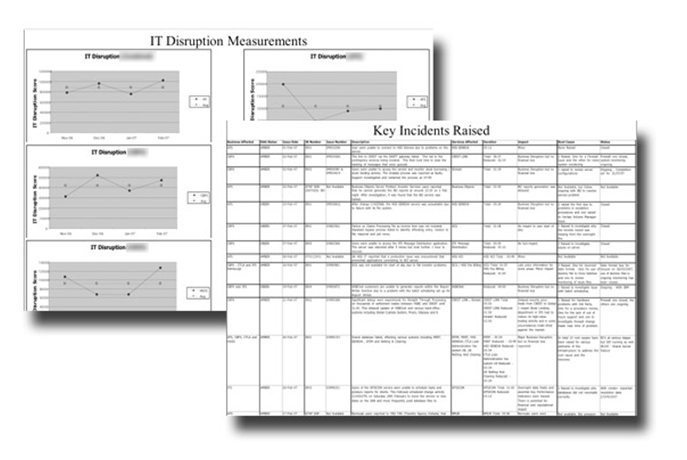 The solution must be in Excel 2000 or more recent, and not require additional software other than Excel and Chart Tamer , MicroCharts and XLCubed. We will publish the top 3 dashboards on our website, so please ensure this is not problematic for any of your submissions. Please change names and data as appropriate in the dashboards to protect the innocent. Final Entries by 19 July 2009, Judges decision final!